Last Thursday afternoon Lizzie says to Benny, "Guess where my daddy works now?" Lizzie yells, "YEAH! MY DAD WORKS AT MCDONALDS!" Thursday night was a big night for our family. 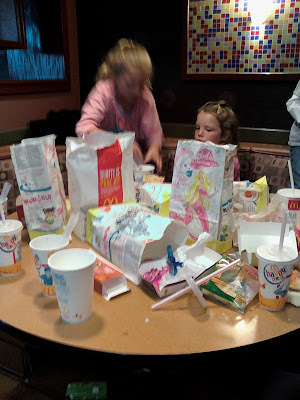 Jeremy's school had a fundraiser hosted by McDonalds. Don't get confused here. He dosen't actually work at MickeyD's. 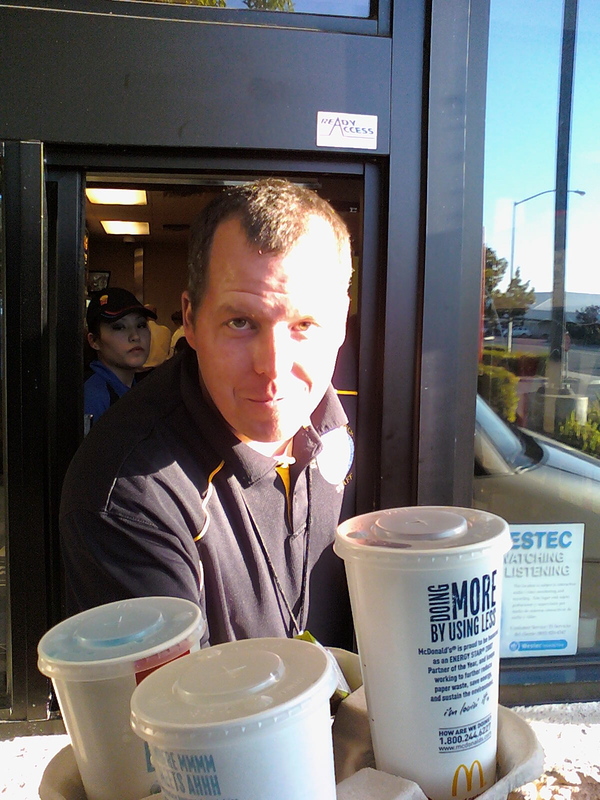 He just got to help out in the drive-thru window for one evening. The kids were stoked! They really thought it was the coolest gig ever. Check him out - being all official as he hands us our food. What service! We just went through the drive-thru so we could see Jeremy doing his thang. Afterward, we grabbed a parking spot and took our food inside to eat with the rest of the crowd that was there to support his school. Here is our contribution to the schools funds. Yeah, that was a lot of trash. AND a lot of food! We shelled out a pretty penny that night for our dinner. But that was the point, right? It was a fun night for everyone. The students even provided some entertainment for their patrons - the Drum Line was there as well as the school's Glee Club. Mama got the night off from cooking dinner. The kids got to eat french fries to their hearts' content. And Daddy got to earn a pretty penny for his school. "Bah, dah, bah, bah, pah... We're lovin' it!"